When FSC released the latest version of its Controlled Wood standard, almost 2 years ago, it was received by the community of certified companies with baffled disbelief. MixedWood reviewed the document at that time, and one of our central messages was “Don’t Panic”. Some folks took our advice, but not all. The overall, and most common, response to the new standard has been to simply delay. But time the time for delays has almost expired. Late in 2016 we wrote another update, in which we characterized the situation as “a sorry mess”. At that time almost no one had actually tried to implement the standard. FSC and various CB’s were busy setting up schedules and deadlines for an implementation process for 2017. Today we are fast-approaching the end of 2017, and essentially all the companies who intend to keep their CW system are finally engaged in the process of actual implementation. We’d like to report that the process is going smoothly, but – of course – we cannot. It has been painful. The practical problems with implementing FSC-STD-40-005 v.3-1 are too many to summarize here. And – importantly – they vary considerably in different parts of the world. In central Europe (we are told) the key challenge is the large array of Centralized National Risk Assessments (CNRA’s) that are being released across large, integrated procurement zones. They include Control Measures (CM’s) which are intended to mitigate the threats to various CW risk indicators. In practice, the CM’s are proving to be poorly vetted, inconsistent, and impractical to apply. The net result is mayhem. 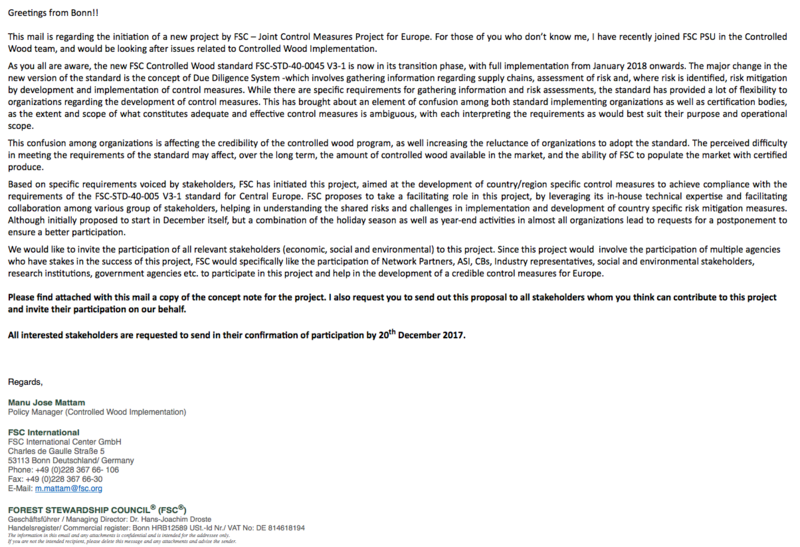 Just this week, an initiate was introduced by FSC-IC to attempt to resolve the EU Control Measure crisis. The effort is styled as the FSC Joint Control Measures Project. You can read about it in this Concept Paper, or respond to this email requesting feedback and collaboration. Here in North America, the situation is perhaps less complex. We have only two countries to consider. The CNRA’s released to date ( USA & Canada) address only non-controversial topics, and our long-promised National Risk Assessment programs have yet to release any new or useful information (more on this below). As a result, all the implementing companies are required to provide Company CW Risk Assessments (CRA’s). All CRA’s published to date in North America, south of the IFL/Caribou “greenline”, reach the same conclusion: Low Risk for all 5 Categories. Given this situation, and the fact that company CRA’s are set to expire for good within the year; we might expect the temporary transition & adaptation of company CRA’s to be a routine process. 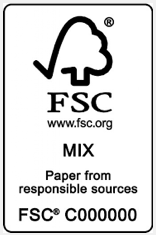 Sadly, nothing is ever routine for FSC Controlled Wood. Here in North America, categories 1, 2, & 5 have never been a problem. We have generally stable and reliable legal frameworks, and no one has yet commercialized GMO trees. Category 4 is a bit more complex, but generally speaking, we aren’t converting a lot of forests either. That leaves us with HCV’s. 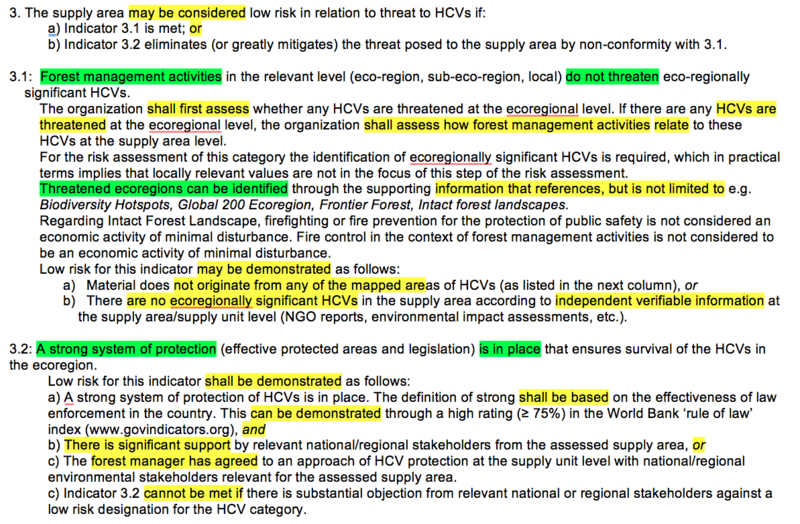 The topic of High Conservation Values (HCV’s) is also much too complex to summarize here. 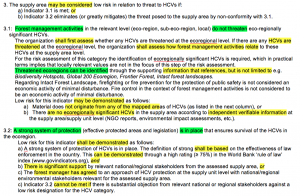 It is worth noting, however, that a practical consensus has evolved over how to apply the HCV concept in Forest Management (FM) certification. This is emphatically NOT true for Controlled Wood. Did you read it? Please read it again. Are you confused? So are we. So is everyone else. We wrote about the complex and confusing challenge for doing Risk Assessment in Category 3 in a post entitled “Risky Business…” back in April. You can click back there and review the details if you are interested or have forgotten. Parsing this convoluted language – over and over – along with other, separately published, guidance (you can find everything linked in the Risky Business article), we have distilled it down to 4 basic steps. These “steps” are clearly not sequential. Less clear is how they interact in practice. When you look at how they are actually implemented, however, some patterns emerge. As companies have updated, revised, or replaced their Company CW Risk Assessments (CRA’s) during the transition to v.3-1, their CRA’s have been subject to increased scrutiny from their CB’s. The scrutiny has unfortunately been wildly inconsistent – as the Certification Bodies (CB’s) struggle, along with everyone else, to understand just what the standard is meant to say. ASI has played a role, as well as the FSC staff in Bonn, the US, and Canada. Everyone means well, but things have not gone well. The process has been very, very frustrating for everyone involved. Practitioners can (and do) disagree whether all of these paths are equally “correct”. We actually consider two to be incomplete – or at least unwise. The fact remains, however, that all five are in common use today, and examples of each can be quickly found by searching the FSC Certificate Database. The irony of all this should be obvious. 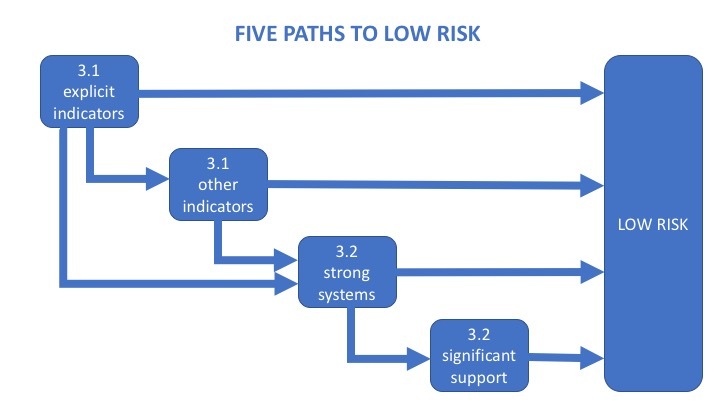 In spite of all this complexity, confusion, disagreement, and frustration; every single Controlled Wood Risk Assessment currently implemented in North America (south of the IFL/Caribou “greenline”) reaches the same conclusion: Low Risk for all 5 Categories. Is this conclusion correct? That remains to open to discussion, but it is inescapable that a broad-based, Low Risk conclusion has been a consensus position for the FSC program since the inception of Controlled Wood in 2004. To change this position, we need a new consensus. And that requires and open, honest, practical, and difficult discussion. A discussion we have been avoiding for years. The FSC national affiliates in the US and Canada have been tasked with resolving this crazy situation by producing National Risk Assessments (NRA’s) that will replace all the individual company CRA’s. They have been working on this for over 3 years, and are still working today. FSC-US produced a draft in early 2015 that is still available on their website. It was widely criticized as impractical, however, and largely abandoned. A new draft is promised, but has yet to see the light of day. We understand that its release is scheduled for later this month. We look forward to it eagerly and promise to provide detailed commentary in this space as soon as it is available. At the end of the day, there is only one solution. We must reach a practical consensus on what Controlled Wood means. Until we do, we cannot expect to design a program that works. To its credit, FSC-IC has embarked on a project designed specifically for this purpose. We applaud the effort and hope to participate in a constructive way. The road will be long and difficult; but there seems to be no alternative. Let’s get to work.